Currently, Wolfram Alpha's domain expertise is limited to some 30 fields, but it covers the most popular ones such as mathematics, weather, health, finance and a smattering of sports statistics. The key thing is not to expect any Google-style results from your questions. For instance, while Wolfram Alpha can compare books, entering 'Salman Rushdie' will only get you the author's birth details and place of birth. Despite its diverse field coverage, the data is mostly centralised to the US. The linguistic field also needs some work: 'English to Spanish' is interpreted as 'UK and Spain', and you get geographical data instead of a language comparison. Wolfram Alpha provides a link to the source information along with its answers, which depending on your query can include over half a dozen books. Even so, advocates of reproducible sciences have concerns about the accuracy of the results. 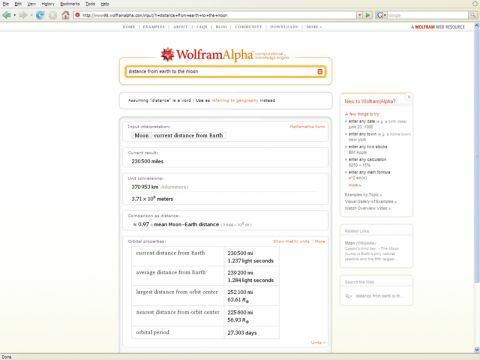 As it is today, then, Wolfram Alpha looks more appealing to the niche user with specialised queries.